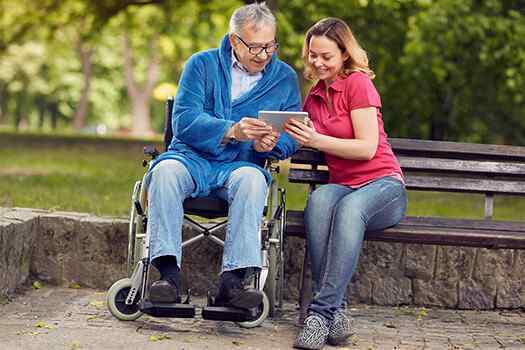 Technology is finally catching up to the needs of caregivers, and you can find a variety of apps, gadgets, and safety systems today to make your duties much easier. However, family caregivers are sometimes so strapped for time that they do not have the opportunity to explore new types of technology or learn complicated procedures. The following types of technology are easy to implement and can enhance your ability to provide care to your senior loved one. Many seniors must keep a record of their blood sugar readings or weight between doctor’s appointments. For caregivers, this can pose a challenge when there are several numbers to remember. With smartphone apps, you can record all the vital information in one place so it is available with the touch of a button when you need to share it with your loved one’s medical team. There are several digital assistants available that essentially function as mini-computers. Consider placing one of these in the kitchen so your loved one can ask for information such as the date or how the weather is outside. You can also use digital assistants to streamline common household tasks such as reordering household supplies, or you can have your loved one record his or her grocery list verbally so you can pull it up on an app. Home video monitoring systems were initially designed to prevent burglaries. However, caregivers can also use them to make sure their loved ones are safe. Simply install video cameras in public areas such as the living room so you can check in on your loved one from far away. You can also use video chats to see how your loved one is doing physically since it allows you to pick up on subtle changes in his or her health. Hiring a professional live-in caregiver is another way to keep a constant check on your loved one’s health and wellbeing. For many seniors in Green Valley, AZ, live-in care is an essential component of aging in place safely and comfortably. However, it’s important for them to have caregivers they can trust and rely on. At Home Care Assistance, we extensively screen all of our live-in and 24-hour caregivers and only hire those who have experience in the senior home care industry. Our strict requirements ensure seniors can remain in the comfort of home with a reduced risk of injury or serious illness. Caregivers sometimes overlook the fun aspects of technology that can enhance their loved one’s health. Today, you can find a variety of video games that require a person to move around to activate the controller. Whether your loved one enjoys playing golf or wants to relive the days of hitting home runs without the weight of a bat, you can turn his or her leisure time into a fun indoor activity. Wandering behaviors are a frightening concern for caregivers, and the fear of a senior being exposed to dangers outside of the home is very real. While you may already use alarms on your loved one’s household doors, there are several tracking devices that can let you know instantly where he or she has gone. Some GPS tracking devices are designed to be worn in the shoes, making it easy to seamlessly implement this type of technology into your caregiving plan. Despite the availability of several tech tools and gadgets, caring for a senior loved one can still be a challenging task at times. Families who find it difficult to care for their aging loved ones without assistance can benefit greatly from professional respite care. Green Valley, AZ, family caregivers who need a break from their caregiving duties can turn to Home Care Assistance. Using our proprietary Balanced Care Method, our respite caregivers can encourage your loved one to eat well, exercise regularly, get plenty of mental and social stimulation, and focus on other lifestyle factors that promote longevity. To learn about our revolutionary in-home care plans, call us at 520-625-2050 today.